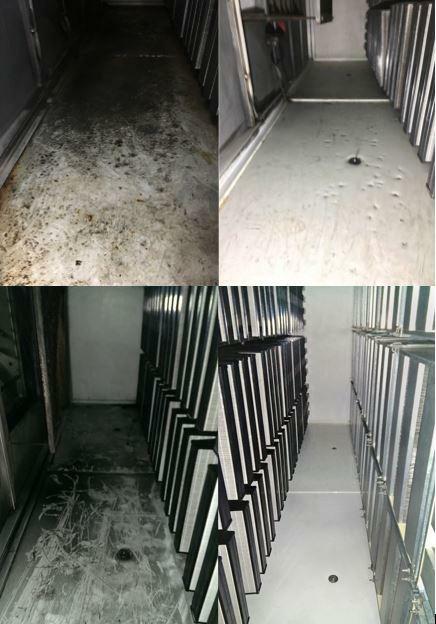 One of our engineers posted some great images on LinkedIn last week showing some of the work done by HVDS’s cleaning team at one of the UK’s largest abattoirs. So, with that in mind, we thought we would take a closer look at some of the challenges that slaughterhouses face and why it is important for a professional team to properly maintain the Air Handling Units (AHU’s). Why are AHU’s so important in slaughterhouses? A part of designing an air handling system is to prevent the occurrence of condensation and, in slaughterhouses condensation can occur during cleaning or during the initial chilling process of hot carcasses. The air is usually supersaturated and warmer than the room’s boundary surfaces, hence it will be depositing a large amount of condensation on the cold surfaces. It is important then for the air to be dried out to keep the moisture levels low in order to prevent product contamination and reduce fungal and/or bacterial growth. It is also necessary for the protection of equipment such as conveyor belts and other machinery from corrosion. For more information and advice on the impact of air handling and ventilation contact us at HVDS on 01785 256976 or sales@hvds.co.uk.